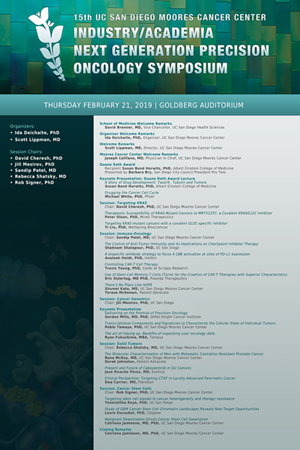 The 15th Moores Cancer Center Industry/Academia "Next Generation Precision Oncology" Symposium was held on Thursday, February 21, 2019. View the photo gallery for the highlights here. Please enjoy the featured talks below from our recent symposium. Thank you! Please note: These videos are for private viewing only. Any unintended use of the videos without consent is prohibited. Dr. Horwitz has a continuing interest in natural products as a source of new drugs for the treatment of cancer. Her contributions span several decades of research and encompass agents which have served as prototypes for some of our most important drugs that are currently in clinical use. She made major contributions to our understanding of the mechanisms of action of camptothecin, the epipodophyllotoxins and bleomycin. However, Dr. Horwitz’s most seminal research contribution has been in the development of Taxol®, a drug isolated from the yew plant, Taxus brevifolia. Dr. Horwitz and her co-workers demonstrated that Taxol®’s antimimotic effects were due to a novel interaction between the drug and microtubules that resulted in stabilized polymers. Dr. Horwitz’s pioneering investigations and perceptive analysis identified Taxol® as a prototype for a new class of antitumor drugs. Although no one was interested in Taxol® when she began her studies, today it is an important antitumor drug approved by the FDA for the treatment of ovarian, breast and lung carcinomas. Dr. Horwitz's research played an important role in encouraging the development of Taxol® by the National Cancer Institute. The drug has since been given to over a million patients. Dr. Gordon Mills is the Director of Precision Oncology and SMMART trials at the Knight Cancer Institute at the Oregon Health Sciences University. He is responsible for the implementation of an integrated program of tumor analysis, decision-making and implementation of novel precision oncology trials. The key goal of these programs is to use serial tumor and liquid biopsies to evaluate and target adaptive responses in real time to interdict cancer evolution. His research covers several areas 1) translating the cancer genome through mechanistic studies; 2) determining the role of genomic and other aberrations present in patient tumors, 3) identification and validation of therapeutic targets emphasizing mechanisms of resistance and rational combination therapy to overcome emerging resistance in evolving cancers, 4) developing, validating, and implementing molecular markers; and 5) integrating data through a cancer systems biology approach into robust predictive mathematical models. The overarching goal of his research program is to perform deep molecular analysis of each patient “to let the patient teach us what is important”. This process is facilitated by the implementation and integration of a comprehensive suite of high-throughput technologies including assessment of genomic aberrations, transcriptional profiles, functional proteomics and metabolomics, and drug screening using conventional and high content imaging systems. He has also implemented a comprehensive functional genomics program designed to distinguish drivers from passengers and identify their therapeutic liabilities. These efforts have been recognized in the Komen Foundation’s Brinker Award for Scientific Excellence and the Finneran Family Prize for Translational Research. Dr. Mills has been very successful in supporting the training, mentoring, and career development for young scientists including graduate students, fellows, and junior faculty, most of whom have developed successful research careers rising through the ranks to full professor, department chairs, and institute directors. Based on his mentoring role, he has been nominated for and awarded multiple mentoring awards, including the Stand Up 2 Cancer Laura Ziskin Prize for Mentoring. A distinguished physician-scientist and leader in the field of gastroenterological research, Dr. Brenner first joined UC San Diego Healthin 1985 as a gastroenterology fellow, later joining the School of Medicine faculty, and serving as a physician at Veterans Affairs (VA) San Diego Healthcare System. He also served as a Pew Scholar in the Biomedical Sciences and a Clinical Investigator in the VA system. In 1993, Dr. Brenner became professor and chief of the Division of Digestive Diseases and Nutrition at the University of North Carolina at Chapel Hill, where he continued to earn accolades for his patient care and research. He was ultimately recruited to UC San Diego Health from Columbia University Medical Center College of Physicians and Surgeons, where from 2003 to 2007 he was Samuel Bard Professor and chair of the Department of Medicine, a member of the Herbert Irving Comprehensive Cancer Center, a member of the Columbia University Institute of Nutrition, and physician-in-chief of New York Presbyterian Hospital/ Columbia. Joseph A. Califano, III, MD, is a board-certified otolaryngologist. He is an internationally recognized head and neck surgeon who specializes in tumors of the oral cavity (mouth), salivary glands, pharynx (throat), larynx (voice box), sinuses, thyroid, and skull base. Dr. Califano has expertise in minimally invasive surgical techniques, including endoscopic laser and robotic surgery, to help best preserve function and appearance in his patients. He has an interest in HPV-related cancers of the throat, as well as premalignant conditions of the upper aero digestive tract. His other areas of investigation include integrative network-based molecular analysis of head and neck tumors; detection of recurrent and occult primary cancer within blood and saliva using molecular biologic techniques; and defining the underlying biology of head and neck cancers. A frequent speaker at national and international meetings, Dr. Califano has coauthored numerous textbooks and book chapters and over 230 peer-reviewed articles related to both clinical and scientific aspects of cancer. His work has appeared in Nature, Oral Oncology and Clinical Cancer Research, among others. He reviews and serves on the editorial board for a variety of medical journals, including Oral Oncology, the most respected specialty journal in head and neck cancer. In his free time, Dr. Califano enjoys rock climbing, and is learning how to surf. He and his wife, Beth, have two children. Dr. Ewa Carrier is Executive Director of Clinical Development at FibroGen, Inc. Prior to FibroGen, she was VP of Medical Affairs at NovaRx Corporation, and Director of Clinical Development and Medical Affairs at Boehringer Ingelheim, developing cancer vaccines and first-in-class PLK inhibitor. Dr. Carrier is a board certified hematologist/oncologist and transplant physician, who spent most of her career in academia, where she trained at Stanford and held a faculty position at the University of California, San Diego from 1997-2012 in the Hematology and Transplant Division. She developed unique mouse model of prenatal transplantation and contributed to the development of reduced toxicity transplants for patients with hematologic malignancies. She also developed a novel patented technology for developing off shelf human red blood cells. She is member of ASH, ASCO and AACR, and is currently focused on the development of new therapies for cancer. David A. Cheresh, PhD, is a leading authority in the study of angiogenesis – the growth of new blood vessels tumors need to grow. Since coming to Moores Cancer Center at UC San Diego Health in 2005, Cheresh has led efforts to develop new collaborations and programs in clinical and basic science with an emphasis on translational medicine. He is Associated Director, Innovation and Industry Alliances, Vice Chair of Pathology, and a Distinguished Professor. Dr. Cheresh studies the signaling networks that regulate angiogenesis, tumor growth, drug resistance and metastasis. He identified that integrin ανβ3 – a receptor on the surface of tumor-associated blood vessels – as a critical biomarker of angiogenesis. He successfully translated laboratory discoveries into biologically-based drugs that are now in various stages of clinical development. Cheresh’s research is widely published, with seven papers cited more than 1,000 times each. Most recently, Cheresh and colleagues have created a novel scaffold-based chemistry approach to stabilize kinases – growth-signaling enzymes – in their inactive state. These studies have led to the development of a first-in-class Raf inhibitor that interferes with angiogenesis signaling pathways. Dr. Cheresh received his doctorate in immunology from the University of Miami School of Medicine. He is the recipient of numerous awards including the 15th Hans Linder Memorial Lecture from the Weizmann Institute of Science in Rehovot, Israel; the XXIII Annual Myron Karon Memorial Lectureship from the University of Southern California; the Robert Flynn Professorship Award from Tufts University School of Medicine; the Judah Folkman lectureship; and the Paget-Ewing award from the Metastasis Research Society/American Association for Cancer Research. He has a received both an American Cancer Society Faculty Research Award and a National Cancer Institute Merit Award. Dr. Ida Deichaite oversees the translational aspects of oncology at MCC, turning innovation into commercial applications. Her work with industry on behalf of MCC conferred competitive advantages to a CIRM Disease Team grant, securing $20 million in funding for an early stage biologic development leading to a clinical trial. This resulted in IND for a first in class biologic drug agent targeting cancer stem cells. Her successful partnering with pharma includes overseeing strategy and execution of translational collaborations between academia and industry, pre-clinical and clinical, in-licensing, and due diligence. She works closely with the CIRM Alpha Clinic at UC San Diego and the Division of Regenerative Medicine securing industry collaborations. She also organizes the MCC annual “Industry/Academia Translational Oncology Symposium”, which has resulted in numerous collaborations. Previously, Dr. Deichaite was Associate Director of Business Development for Avanir Pharmaceuticals. During her tenure, she established a technology evaluation program for in-licensing compounds. She has co-founded several drug development start-ups. She is a member of the UCSD Innovation Advisory Board and Section Editor of Science Policy and Industry/Academia Interface of the Journal of Translational Medicine. Dr. Deichaite is widely published in numerous scientific journals. Dr. Deichaite received her Ph.D. from Princeton University, Masters degree from the Weismann Institute, and BA from Hebrew University. Dr Laure Escoubet joined Celgene in 2006 bringing her epigenetic expertise to bear immediately with the identification and validation of promising epigenetic targets in cancer through a functional genomic screen, effectively launching Celgene’s epigenetic drug discovery efforts. Laure has been supported the pre-clinical development of small molecule inhibitors and provided expertise to the external epigenetic AGIOS, Epizyme and Quanticel collaborations. She designed the first comprehensive epigenetic profiling of cancer stem cells, allowing the identification of proprietary transcriptional and epigenetic targets. Prior to Celgene, Laure did her post-doctoral training at the University of California, San Diego, in the laboratory of Christopher K. Glass. There, she pioneered genome-wide epigenetic studies in inflammation, investigating the regulation of chromatin modifications in macrophages and the orchestrated program that controls gene expression in these cells. Laure received her PhD in Human Pathophysiology from the University Paul Sabatier in Toulouse, France. Ryan Fukushima joined Tempus in September 2015 and serves as Chief Operating Officer, overseeing all product and operational capabilities as well as leveraging clinical and genomic datasets to support Tempus' life science business. Prior to Tempus, Ryan was an Entrepreneur-in-Residence and Vice President at Lightbank, focusing investments on enterprise software and launching businesses. Earlier he was at Hyde Park Venture Partners, where he concentrated on early stage enterprise investments. Before landing in Chicago, Fukushima worked predominantly as an engineer, designing and implementing backend systems for Cisco and VMware. Fukushima has received a bachelor’s degree in Engineering from California Polytechnic University and holds an MBA from the Ross School of Business at University of Michigan, where he was a Zell Scholar. Analeah leads translational research at Inhibrx and is responsible for multiple IND filings annually. Prior to joining Inhibrx she spent ten years at Novartis in biologics drug discovery in multiple roles from oncology target validation through candidate optimization for varied therapeutic modalities, including antibody drug conjugates and immune activating agents. Analeah holds a doctorate degree from the University of California, San Francisco in biochemistry and molecular biology and completed her postdoctoral research at the Genomics Institute for the Novartis Research Foundation. Catriona Jamieson, M.D., Ph.D., is Professor of Medicine in the Division of Hematology-Oncology, Deputy Director at UC San Diego Moores Cancer Center, Koman Family Presidential Endowed Chair in Cancer Research, Chief of the Division of Regenerative Medicine, Deputy Director of the Sanford Stem Cell Clinical Center, Co-Leader of the Hematologic Malignancies Program, and Director of Stem Cell Research at UC San Diego Moores Cancer Center. Dr. Jamieson specializes in myeloproliferative disorders (MPDs) and leukemia. Myeloproliferative neoplasms are a family of uncommon but not rare degenerative disorders in which the body overproduces blood cells. Myeloproliferative neoplasms can cause many forms of blood clotting including heart attack, stroke, deep venous thrombosis, and pulmonary emboli and can develop into acute myelogenous leukemia. Although some effective treatments are available, they are laden with serious side effects. In addition, individuals can become resistant to the treatments. Dr. Jamieson studies the mutant stem cells and progenitor cells in myeloproliferative neoplasms. These cells can give rise to cancer stem cells. Cancer stem cells may lie low to evade chemotherapy and then activate again later, causing disease progression and resistance to treatment. Her goal is to find more selective, less toxic therapies. Dr. Shumei Kato is Assistant Clinical Professor at the Experimental Therapeutics program, UCSD Moores Cancer Center. Dr. Kato’s research interest has been the identification of molecular targets among patients with diverse cancers, as well as to identify the response/resistance mechanism from targeted and/or immunotherapeutic agents, that may be transformed into patient care. Scott M. Lippman, MD, brings more than 25 years of experience as principal investigator of translational research involving investigator-initiated clinical trials and maintains an active clinical practice. As a clinician, he is well-respected by his peers, with recognition in every major “Top Doctor” listing including U.S. News & World Report. His research interests include clinical and translational research focused on head and neck and lung cancer; genetic drivers of cancer; predictive molecular signatures, biomarkers for clinical response in solid tumors; design of trials using molecular targets and markers for cancer prevention and therapy. Since 1990, he has had continuous funding from the National Cancer Institute (NCI), including as principal investigator of major programmatic grants to develop personalized or precision medicine. He received The University of Texas MD Anderson Cancer Center team science award for his leadership of the multidisciplinary molecular-guided Biomarker-integrated Approaches of Targeted Therapy for Lung Cancer Elimination (BATTLE) trial for lung cancer. Dr. Lippman is Director of Moores Cancer Center at UC San Diego Health, the only NCI-designated comprehensive cancer center in the region. He is Senior Associate Dean and Associate Vice Chancellor for Cancer Research and Care, Professor of Medicine, Chugai Pharmaceutical Chair and adjunct professor at the Salk Institute for Biological Studies, Sanford Burnham Prebys Medical Discovery Institute and MD Anderson Cancer Center. Prior to arriving at Moores Cancer Center in 2012, Dr. Lippman was chair of the Department of Thoracic/Head and Neck Medical Oncology at MD Anderson Cancer Center. Dr. Lippman has participated in the national leadership of clinical and translational research planning and development within the National Cancer Institute Cooperative Group setting and currently sits on the NCI Clinical Trials and Translational Research Advisory Committee (CTAC). He chairs the CTAC Clinical Trials Strategic Planning subcommittee and is chair of the NCI Chemo/Dietary Prevention Study Section. He serves on several NCI advisory boards, NCI cancer center external advisory boards and journal editorial boards. Dr. Lippman has served on the United States Food and Drug Administration Oncologic Drugs Advisory Committee and was elected to the board of directors for the American Association for Cancer Research (AACR), Association of American Cancer Institutes and National Comprehensive Cancer Network. Dr. Lippman completed fellowships in hematology and medical oncology at Stanford University and University of Arizona and internship and residency in internal medicine at Johns Hopkins Hospital and Harbor-UCLA Medical Center. He received his medical degree from Johns Hopkins University School of Medicine and is triple-board certified in internal medicine, hematology and medical oncology. Author of more than 350 publications in high-impact journals, including The New England Journal of Medicine, JAMA, PNAS, and The Lancet, and chapters in major medical textbooks, Dr. Lippman has received many awards, among them the American Society of Clinical Oncology (ASCO)-American Cancer Society Award, AACR Cancer Research and Prevention Foundation Award, and the ASCO Statesman Award, and was elected to the Association of American Physicians, the most prestigious physician-scientist society in the world. Yi Liu, Ph.D., is one of Kura’s co-founders and has served as Chief Scientific Officer since October 2014. Prior to joining Kura, Dr. Liu co-founded and served as Chief Scientific Officer of Wellspring Biosciences Inc., a private biopharmaceutical company, from July 2012 to September 2014. Dr. Liu also co-founded Intellikine, Inc., a private biopharmaceutical company, where he served as Vice President of Drug Discovery from 2007 to May 2012, until its acquisition by Takeda Pharmaceuticals. Prior to Intellikine, Dr. Liu was the head of the drug design group at the Genomics Institute of the Novartis Research Foundation. Earlier in his career, he held senior scientist positions at both SGX Pharmaceuticals, Inc., a public biopharmaceutical company which was acquired by Eli Lilly and Company in 2008, and Curagen Corporation, a public biopharmaceutical development company. Dr. Liu received his Ph.D. in Biochemistry from Princeton University, his MSc in computational chemistry from Beijing University and his BE in Chemical Engineering from Tsinghua University. As an Assistant Professor in the Department of Medicine, Dr. McKay instructs medical students, residents, and fellows at UC San Diego School of Medicine. Her primary research interests include the design and implementation of clinical trials to advance the treatment of patients with genitourinary cancers. As a clinical investigator, she is committed to advancements in cancer care that will improve the lives of cancer patients. Furthermore, she is interested in understanding mechanisms of response and resistance to specific cancer therapies. Her work has appeared in peer-reviewed publications such as the Journal of Clinical Oncology, Clinical Cancer Research, and Cancer, among others. Additionally, Dr. McKay serves as the Genitourinary Oncology Disease Team Co-Leader. She is responsible for coordinating clinical, research, and educational programing within the Genitourinary Oncology Disease Team including strategies to improve the delivery of patient care and expand the clinical and translational research portfolio within the group. Dr. McKay completed a fellowship in oncology/hematology at the Dana-Farber Cancer Institute, Harvard Medical School. She completed a residency in internal medicine at John Hopkins School of Medicine in Baltimore, Maryland. Dr. McKay earned her medical degree at the University of Florida College of Medicine in Gainesville, Florida. She is board-certified in internal medicine and medical oncology. Teresa McKeown is a patient advocate and participant in the I-Predict clinical trial (ClinicalTrials.gov Identifier: NCT02534675). Since her remarkable response to personalized medicine, she has shared her story at many events, including Foundation Medicine's Networking Reception at the 2018 ASCO Conference in Chicago, San Diego Breast Cancer Support Group Meetings, Women's Retreats, and college campuses She also reaches out personally to many cancer patients who have learned of her through social media. Teresa is immensely thankful for the opportunity to represent hope and healing by way of precision medicine. Jill Mesirov is associate vice chancellor for computational health sciences and professor of medicine at UC San Diego School of Medicine. As associate vice chancellor, Mesirov is responsible for the overarching strategy for computational health sciences and research computing at UC San Diego School of Medicine. She is a member of the UCSD Moores Cancer Center, where she serves as co-lead for the structural and functional cancer genomics research program. Mesirov is a computational scientist who has spent many years working in the area of high-performance computing on problems that arise in science, engineering, and business applications. Her research focuses on cancer genomics applying machine-learning methods to functional data derived from patient tumors. The lab analyzes this molecular data to determine the underlying biological mechanisms of specific tumor subtypes, to stratify patients according to their relative risks of relapse, and to identify candidate compounds for new treatments. In addition, Mesirov is committed to the development of practical, accessible software tools to bring these methods to the general biomedical research community. Her tools support over 300,000 users worldwide. Before moving to UCSD in 2015, Mesirov was associate director and chief informatics officer at the Broad Institute of MIT and Harvard, formerly the Whitehead Institute/MIT Center for Genome Research, where she directed the Computational Biology and Bioinformatics Program. She previously served as manager of computational biology and bioinformatics in the Healthcare/Pharmaceutical Solutions Organization, director of research at Thinking Machines Corporation and has also held positions in the mathematics department at the University of California at Berkeley and served as associate executive director of the American Mathematical Society. Mesirov, a former president of the Association for Women in Mathematics, is a fellow of the American Association for the Advancement of Science (AAAS), the American Mathematical Society (AMS), and the International Society for Computational Biology (ISCB). Pete Olson is the Director of Research at Mirati Therapeutics, a company focused on developing innovative, targeted therapies for the treatment of cancer. Mirati is developing a covalent KRAS G12C inhibitor for the treatment of lung, colon and other KRAS G12C-mutant cancers as well as a spectrum-selective receptor tyrosine kinase inhibitor in combination with a checkpoint inhibitor, for patients who progress on checkpoint inhibitor therapy. Prior to joining Mirati, he was a Senior Group Leader in the Oncology Research Unit at Pfizer. Pete received his Ph.D. from UCSD and conducted his thesis work in Ron Evans’ lab at The Salk Institute studying the role of nuclear fatty acid receptors in metabolic disease and cancer. He did his postdoc in Doug Hanahan’s lab at UCSF where he used mouse models to interrogate mechanisms of tumorigenesis and as a platform to test experimental therapeutics. Dr. Eric Ostertag is currently the Chief Executive Officer of Poseida Therapeutics, a clinical-stage company using proprietary non-viral gene engineering technologies to create CAR-T and other therapies in pursuit of a potential cure for a number of cancers, including multiple myeloma. Before starting Poseida, he founded and served as the Chief Executive Officer and President of Transposagen Biopharmaceuticals, Inc., a gene editing technology company focused on research reagents, and from which Poseida was spun out in 2015. Dr. Ostertag received both his Ph.D. in Molecular Biology and his M.D. from the University of Pennsylvania School of Medicine and his B.S. in Genetics from the University of Wisconsin-Madison. Dr. Sandip Patel, MD is an Associate Professor at UCSD and a medical oncologist focused on early development of novel immunotherapy, in particular early phase clinical trials of cancer immunotherapy and thoracic oncology immunotherapy trials. His research focus is on predictive biomarkers for immunotherapeutic response and generation of personalized cancer immunotherapy regimens. He is co-leader for the Experimental Therapeutics (Phase 1) Program and Deputy Director for the Center for Precision Immunotherapy at UCSD. He is Assistant Director of the Clinical Trials Office at UCSD Moores Cancer Center and a member of the Cancer Immunotherapy, Experimental Therapeutics (Phase 1), and Thoracic Oncology Programs. Dr. Patel earned his medical degree at Baylor College of Medicine, while performing research at MD Anderson Cancer Center. He completed a residency in Internal Medicine at UCLA Medical Center. He completed a fellowship in Medical Oncology and Hematology at Duke University Medical Center. He is triple board-certified in internal medicine, medical oncology, and hematology and was named a “Top Doc” in the most recent San Diego Magazine Physicians of Exceptional Excellence survey. Dr. Jose Ricardo Perez has served in leadership positions in academia, healthcare, and pharmaceuticals. Currently he is an Executive Medical Director of Medical Affairs at Exelixis, responsible for Genitourinary Cancers and Sarcomas. In previous roles he created and lead the world’s largest expanded access protocol for patients with myelofibrosis using innovative therapies in collaboration with clinicians in multiple centers of excellence in major European centers. Formerly, Dr.Perez practiced as a Medical Doctor, Specialist in Internal Medicine and in Clinical Oncology in Venezuela taking care of patients with Cancer. With an active participation in clinical trials he contributed in the development of safe and more effective therapies to patients with diverse types of cancer. Tannishtha Reya received her B.A. in Biology from Williams College and her Ph.D. in Immunology from the University of Pennsylvania. She subsequently completed her postdoctoral training at the University of California at San Francisco and Stanford University. Dr. Reya joined the Duke University faculty in 2001 and served as the Co-Director of the Stem Cell Biology and Regenerative Medicine Program at the Duke University Comprehensive Cancer Center. She was recruited to the University of California San Diego in 2010 where she is a Professor in the Departments of Pharmacology and Medicine and Co-Director of Cancer Biology in the Biomedical Sciences Graduate Program. Dr. Reya has made key contributions to the field of cancer biology by defining the signals that control stem cell growth, and how these signals are subverted to drive cancer progression and therapy resistance. For her work, Dr. Reya has received several awards, including the Leukemia and Lymphoma Society Scholar Award, the Presidential Early Career Award for Scientists and Engineers from the U.S. government, the Pioneer Award from the National Institutes of Health and the Outstanding Investigator Award from the National Cancer Institute. Dr. Robert A.J. Signer is a stem cell biologist whose trailblazing work on protein synthesis in hematopoietic stem cells opened the door to unchartered areas of cellular investigation. Dr. Signer is currently an Assistant Professor of Medicine in the Division of Regenerative Medicine at the University of California San Diego. Previously, Dr. Signer worked alongside Dr. Sean Morrison as a Postdoctoral Fellow at the University of Texas Southwestern Medical Center. He earned a Ph.D. in Cellular and Molecular Pathology from the University of California, Los Angeles, and a Bachelor of Applied Science in Engineering Science (Biomedical) from the University of Toronto. Dr. Signer has published multiple high-profile papers in top tier scientific journals, including Nature, Cell, eLife, Cell Stem Cell, and Genes and Development. He has presented leading-edge scientific discoveries around the world, including at the International Society for Stem Cell Research, the Howard Hughes Medical Institute Science Meeting, and numerous Keystone Symposiums, among others. Coupled with his excellent track record of fellowship and grant funding, Dr. Signer is poised to become one of the foremost thought leaders in stem cell science. A sports enthusiast and adventure traveler, Dr. Signer, a native Canadian, currently lives with his family in San Diego, California. Dr. Shalapour is an assistant adjunct professor at UCSD Department of Pharmacology. She started her research career with a Diploma degree in Biochemistry from the Department of Biochemistry at the University of Duesseldorf (Germany). After completing her Diploma thesis, she shifted her focus to cancer research with an emphasis in immunology. She received her PhD under the supervision of Dr. Blankenstein, a leading cancer immunologist at the Institute of Immunology, in a collaboration with Dr. Henze, a clinician in the field of childhood acute lymphoblastic leukemia (ALL) treatments (ALL-BFM trial) at the Department of Pediatric Oncology/Hematology at the Charité-Medical University of Berlin. Her PhD thesis involved experiments studying the relationship between bone marrow (BM) stroma cells and acute lymphoblastic leukemia cells. Thereafter, she decided to continue her focus on tumor immunity and inflammation. She was awarded the German Research Foundation fellowship, and in August 2012, she joined the laboratory of Dr. Michael Karin at UCSD to study inflammation and cancer. Her scientific focus is to understand the basic mechanisms of how chronic inflammation regulates the adaptive immune response to cancer. She has recently found that chronic liver inflammation promoted accumulation of liver resident IgA+ plasma cells with potent immunosuppressive properties (Shalapour et al., Nature, 2017). These cells, termed ISP, promote tumor growth and resistance to therapy by inhibiting activation of cancer-directed cytotoxic T cells (CTL). First identified in prostate cancer, ISP accumulate in response to androgen ablation or oxaliplatin treatment and prevent CTL-mediated tumor regression (Shalapour et al., Nature, 2015). For her work, she has been awarded with the CRI-Irvington and Prostate Cancer Foundation Young Investigators Award. Rebecca A. Shatsky is a board-certified medical oncologist who specializes in treating breast cancer. She uses numerous forms of therapy such as chemotherapy, hormone therapy, biological therapy and targeted therapy to offer the best treatment options for her patients. As a medical oncologist at an academic medical center, Dr. Shatsky teaches residents and fellows at UC San Diego School of Medicine. She conducts breast cancer research at Moores Cancer Center at UC San Diego Health and is currently working on launching a phase I clinical trial that focuses on the treatment of locally advanced and metastatic breast cancer. Her research work, funded by a grant from the Breast Cancer Research Foundation, targets the ROR1 receptor in breast cancer treatment. Her work has been published in Annals of Emergency Medicine, Cancer Treatment Reviews and Personalized Medicine in Oncology, among others. She presented on the topic of detecting molecular alternations in breast cancer at the San Antonio Breast Cancer Symposium. Dr. Shatsky completed a hematology/oncology fellowship at UC San Diego School of Medicine, where she was recognized as an outstanding oncology fellow by the National Comprehensive Cancer Network. She completed her residency at UCLA David Geffen School of Medicine and earned her medical degree from the Keck School of Medicine of University of Southern California. She is board certified in internal medicine, hematology and medical oncology. Dr. Shatsky is a member of the American Association for Cancer Research, the American Society of Clinical Oncology, and the American Society of Hematology. Outside of work, she enjoys spending time with her husband Chris and daughter, Bailey, hiking and traveling. Pablo Tamayo is currently Director of the UCSD Center for Cancer Target Discovery and Development (CTD2) and Professor in the Department of Medical Genetics UC San Diego School of Medicine. Dr. Tamayo has a Ph.D. in Physics from Boston University and worked at Los Alamos National Lab., Thinking Machines Corp. and Oracle Corp. During the last two decades, mainly at the Whitehead and Broad Institutes he has worked on the study of oncogenes, cancer pathways and targets, molecular signatures of oncogene activation and dependence, treatment outcome, disease subtypes, gene dependency and drug response. He has been involved in the development of many genomic analysis methodologies, including the first use of Self-Organizing Maps for clustering gene expression data, the first classification algorithm for Leukemia subtypes, the Metagene Projection method, Gene Set Enrichment Analysis (GSEA), the Molecular Signatures Database (MSigDB), and Bayesian patient stratification models. Recently he has been working on the development of analysis methods for the functional characterization of cancer genomes including RNAi and CRISPR genetic dependencies, the REVEALER algorithm to identify groups of genomic alterations that together correlate with a given activation, gene dependency, or drug response profile, DisCoVER, a method to find drugs or perturbagens that associate with a given oncogenic signature, and Onco-GPS, a data-driven analysis framework to identify and characterize oncogenic cellular states. Michael White, PhD, joined Pfizer in 2016 as CSO for Tumor Cell Biology, in the Oncology Research and Development Group. His group is focused on the discovery and development of lead-in-class small molecule cancer therapies. Prior to Pfizer, White was Professor of Cell Biology; Associate Director of Basic Science for the Harold Simmons Comprehensive Cancer Center; and inaugural Director of the Cancer Intervention and Prevention Discovery program at UT Southwestern Medical Center. The research in White's academic group over the past 20 years has helped define the nature of oncogenic cell regulatory networks; decode the molecular architecture of mitogenic signaling pathways; enrich functional annotation of cancer genomes; and deliver genomics-guided cancer intervention target nominations. This work has been described in ~150 publications with over 12,000 citations and an H-index of 65. At Pfizer, his group pursues chemically addressable targets that intercept oncogenic signaling networks; modulate tumor/host interactions; and promote productive anti-tumor immune responses. They partner with colleagues in Medicinal Sciences, Drug Safety R&D, and Clinical Development to help deliver first-in-class small molecule drugs that benefit patient populations with unmet need. Dr. Young is the Vice President of Biologics at Calibr, a division of Scripps Research. He received a BS in biochemistry from Boston College and a PhD in chemical biology from The Scripps Research Institute as an ARCS scholar. At Scripps, his work focused on the development of unnatural amino acid incorporation methodologies to improve the properties of therapeutic proteins. This work was foundational for the development of programs in the Calibr pipeline today, including a bispecific antibody for prostate cancer which will enter clinical trials next year. After receiving his PhD, he completed a postdoc at Harvard Medical School with an NIH fellowship, in the department of Biological Chemistry and Molecular Pharmacology with Dr. Christopher T Walsh. Dr. Young was a member of the founding group of principal investigators at Calibr and serves as the lead investigator on multiple bench-to-bedside antibody and cellular therapy-based programs. Dr. Young maintains a research group focused in the development of novel therapeutics at the interface between protein engineering and synthetic biology. This research spans multiple disease indications including cancer, autoimmune, metabolic disorders, and infectious disease. His work has been highly awarded and received support from the Wellcome Trust, NIH (National Cancer Institute), Department of Defense, Mesothelioma Research foundation, American Cancer Society, among others. His work has resulted in numerous publications and patents with >1500 citations in the past 5 years. Dr. Young’s lead program, a switchable CAR-T cell platform, was recently partnered with AbbVie. This broad relationship enables his team to lead the first in human clinical study for the switchable CAR-T cell platform while studying the potential to expand CAR-T cell impact into solid tumors. For our out of town attendees: We recommend staying at the Estancia La Jolla Hotel and Spa for your lodging needs. The UCSD corporate rate is subject to availability and this rate is $195 when it is available. Rooms can be booked via this link. We encourage you to make your reservations as soon as possible due to availability. The field of oncology is changing at a rapid pace, one that demands all involved to create new paradigms for cancer research and treatment. The goal is curative therapies. The bar is set high – and no one can do it alone. Targeted interactive meetings are of great value, leading to productive discussions often maturing into research and clinical alliances among various contingencies such as pharma/biotech, academia and funding agencies. The Industry/Academia “Next Generation Precision Oncology” Symposium is a unique forum uniting life science innovators from around the world to brainstorm translational oncology research. Presentations and discussions focus on how recent developments in oncology translate into clinical applications and lifesaving therapeutic options for cancer patients. In light of precision medicine and its tremendous impact on the broad field of oncology, this forum recognizes the clear direction we are headed: precision diagnosis and personalized treatment increasingly relying on cell therapies. Combination immunotherapy and new immunomodulatory agents are bringing to light exciting opportunities for development of new therapeutic modalities in oncology. Symposium presenters emphasize the importance of innovative discovery model systems and biomarker driven clinical trials to predict treatment outcomes with the aim of meeting patients' specific needs. The Symposium’s emphasis on translational oncology and drug development unites discovery and clinical development researchers, facilitating alliances and partnerships, ultimately accelerating curative therapies that advance global cancer care. The Symposium promotes discussions amongst leaders in cancer research. Invited presenters are clinicians, researchers, patient advocates and key decision makers in industry and academia. The Symposium format includes keynote presentations by renowned key opinion leaders, followed by selected presentations, a young investigator presentation, interactive discussion panels, and poster sessions. Discussions continue throughout breaks with networking opportunities built into the Symposium agenda. Program presenters and attendees identify successful approaches to advance life-saving therapies, tools, and diagnostics to best serve the patient. The field of oncology is brimming with innovators and investigators ready to blaze new pathways for bringing the most effective novel therapies out of the laboratory to the patients. Clinicians, researchers, and top decision makers are critical in the process of translation to deliver curative cancer therapies. Our goal is to unite these individuals and provide a forum through which they can network and collaborate, while celebrating the community’s successful efforts. San Diego provides an ideal environment for successful partnerships and collaborations: The intersection of academia, biomedical research, top-notch health care providers, and entrepreneurship allow innovation to abound. San Diego’s position as a global hub for biomedical innovation serves as a role model for translational oncology on a national level.